When I first started delving into my family history, my paternal Danish roots were probably the branch of my tree that I knew the least about (to be honest, this is probably still the case despite the discoveries I have made). Once I started gathering information online, I was also surprised that I seemed to be the first "serious" researcher for this line. I couldn't find any online public trees or message board posts about this particular family. While this annoyed me at first, as it meant that progress was much slower, I have come to really appreciate having the opportunity to uncover this line's stories on my own. 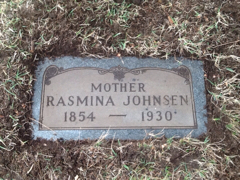 So for my first ancestor profile, I would like to introduce you to Rasmine "Minnie" Dorothy Margaret Rasmussen, my paternal 2x great grandmother. Minnie was born on January 26, 1853 in Gloslunde, Maribo, Denmark, to Rasmus Rasmussen and his wife Mette Kirstine, just 4.5 months after their marriage in September 1852. With the arrival of spring, came her christening on May 1, 1853 at the local church. The entry for Minnie's birth in the Maribo church record book. In 1855, there was a Danish census held and little Minnie was living with her parents, a new baby brother, her paternal grandmother, and her father's apprentice. Her father is working as a carpenter in the area. The family in the 1855 Danish census. In 1860, there was another Danish census and the Rasmussen family had grown by two more children. Minnie, now 8, has been joined by siblings Lars, Ane, and Rasmus. Minnie's youngest brother, Rasmus, has not yet been christened, so is recorded on the census as "Udøbt drengebarn" (unbaptized boy) rather than by name. Most of Minnie's later American census records concur that she immigrated from Denmark to the United States in 1873. I have not yet been able to conclusively identify her on a passenger list; however, there is one listing in the Danish police emigration contract records that looks promising. It is a listing for a Rasmine Rasmussen, 20 years old and single, heading for New York City on March 27, 1873. The last place of residence is recorded as Langeland, Svendborg which is where Minnie's mother was originally from, so it is possible that she was staying with maternal family members prior to leaving for America. 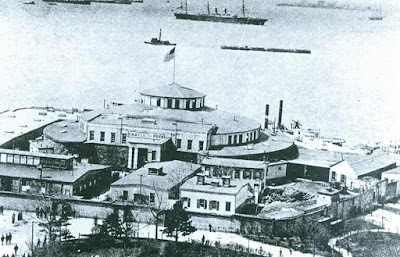 Whether this is the correct record for my Minnie or not, it is likely that she would have travelled via an indirect route from Scandinavia to America and likely arrived into the Port of New York through the Castle Garden Immigration Center. 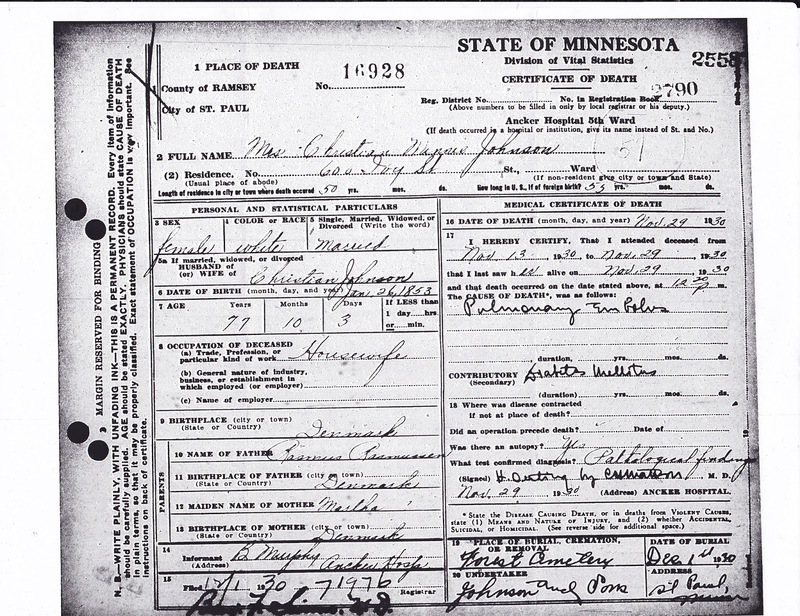 Newgard-Rasmussen marriage record from the Wisconsin Historical Society. Within a few years of arriving in America romance was in the air, and Minnie was married to another Danish-American immigrant, Peter Marten Peterson Newgard. The wedding took place in Hudson, Wisconsin on June 26, 1875. This marriage would ultimately prove to be ill-fated; however, for the next five years the couple moved around throughout a number of locations in Wisconsin and Minnesota. The 1880 census has Minnie (26) living in Odin, Watonwan, Minnesota with Peter (28) who is working as a farmer and their three children: Karen (4), Rosa (3), and Peter (1). 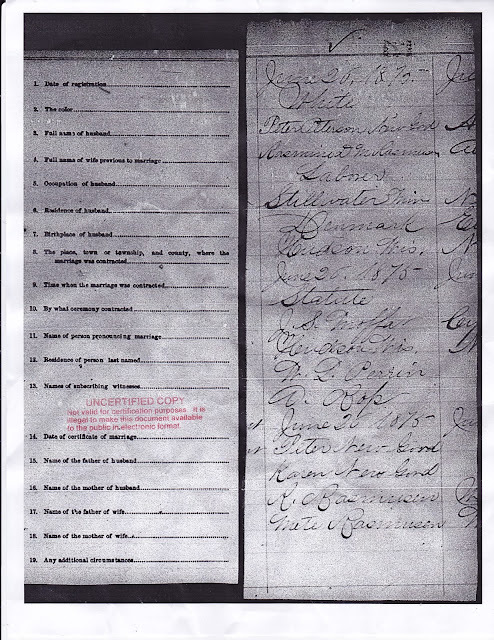 Ultimately, however, the young family settled in St. Paul, Minnesota, and this is where they are found in the 1885 Minnesota state census along with two more children Lee and John Louis. 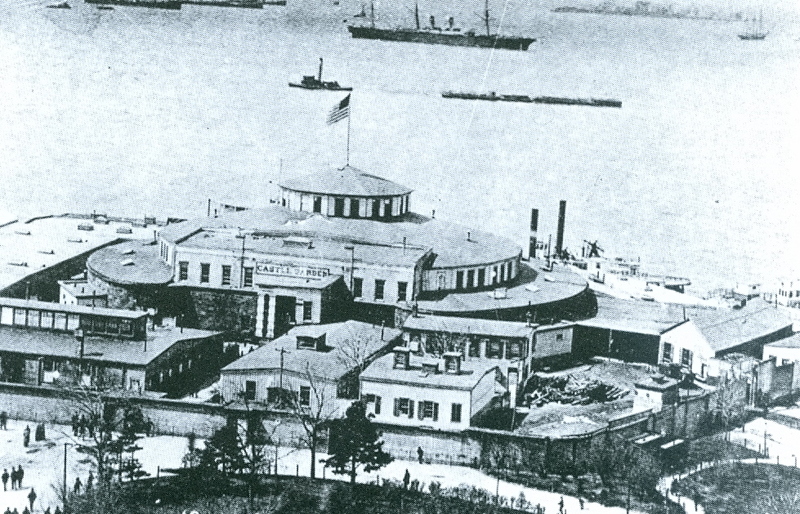 It is also likely around 1885 that Peter Newgard became a naturalized American citizen, and the legal framework at the time meant that his wife, Minnie, was automatically naturalized as well. Two more children were born to the couple, Frederick Albert in 1888 and Burtin Leslie in 1890. However, on October 3, 1891, Peter Newgard deserted the family and left behind Minnie and their seven children ranging in age from 16 to 2. Newspaper clipping from the St. Paul Daily Globe. After waiting the legally-mandated three years, on November 9, 1894 a notice was published in the St. Paul Daily Globe that Minnie has applied for a divorce order. The court records show that there are some delays in the proceedings due to an inability to locate Peter Newgard in order to serve him with the summons. It seems Minnie believes he may be living with another woman in Chicago, Illinois; however, she does not have an address where he could be reached. In a compromise, the summons were published for six successive weeks in the St. Paul Dispatch and an additional copy of the papers were deposited under Peter Newgard's name at a post office in Chicago. Ultimately, after listening to testimony from Minnie and a few others, the Judge rules in her favour. In his decision, Judge Egan states that during the marriage Minnie "performed fully, freely, and honourably all of her duties as wife of the defendant" and that since Peter's "desertion has supported and provided for the seven children . . . with such assistance as they could give her, has cared for them wholly herself by her own labour." As a result, on February 15, 1895, he granted her a divorce as well as full custody over all the children. Given the strict views in the time period surrounding divorce and women in the workforce, it could not have been easy for Minnie to survive as a single mother to seven children. In fact, the 1895 Minnesota state census demonstrates the difficult financial situation of the family clearly. Minnie is working as a housekeeper and has taken in a number of boarders including a seamstress, a driver, and the large Johnson family. The three oldest Newgard children still living at home are all also working to support the family: Rosa as a clerk, Peter as a driver, and Lee as an errand boy. 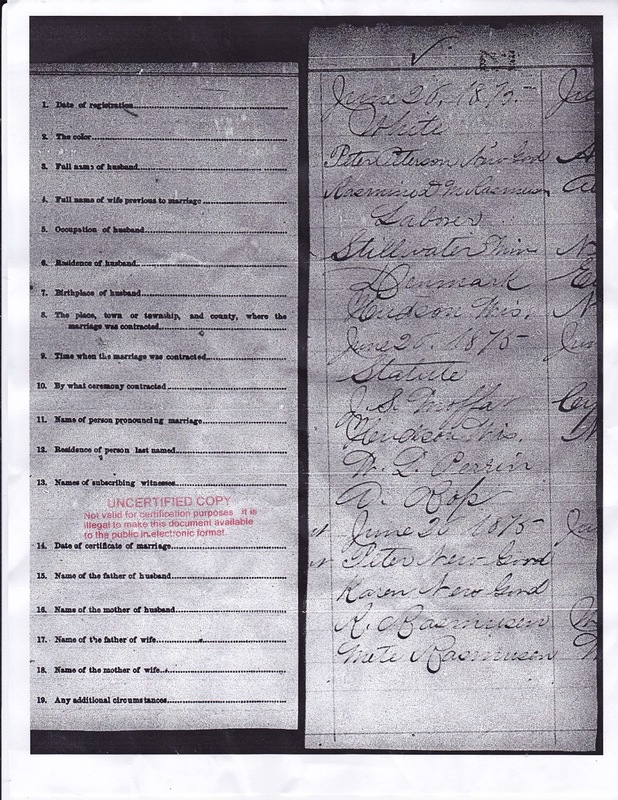 The 1895 Minnesota state census showing the Newgard family. The social stigma towards being a divorced woman is also evidenced in the St. Paul city directories for this time period where Minnie consistently chooses to instead label herself as a widow. In 1898, things finally take a turn for the better for Minnie, and she is married again to Christian Johnson, the Norwegian widower who has been her boarder for a number of years. At least as far as the paper trail can show, this is a much happier marriage for Minnie. A typical city street in St. Paul circa 1908 (source). The newly blended family in the 1900 US federal census. 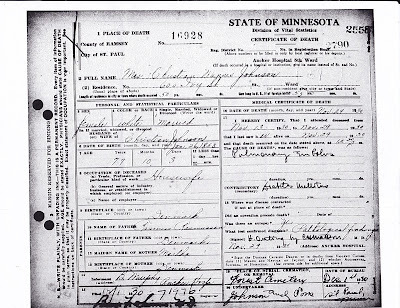 Census returns show Minnie and Christian raising their step-children together in St. Paul in 1900, 1905, 1910, 1915, and 1920. Christian is initially working as a stone mason, and eventually works his way up to being a contractor. Evidently this provides a comfortable wage, as Minnie is able to stop working as a housekeeper and/or boarding house proprietor and the youngest Newgard children are able to attend school. The 1930 US census finds Minnie living with Christian, now retired, at the home they own at 600 Ivy Street. Valued at $1000, it seems theirs is a modest home when compared to the value of the neighbouring lots; however they were within the 10% of the American population to own a radio set. It is easy to imagine Minnie preparing dinner or perhaps relaxing in the evening with a crackly radio program on in the background. Sadly, the 1930 census would be Minnie's last, as she died of a pulmonary embolism on November 29, 1930 at Ancker Hospital. Aged 77 years, 10 months, and 3 days, she had been living in the United States for more than 55 years. Her internment took place at Forest Lawn Cemetery on December 1, 1930. She would eventually be joined there by Christian Johnson in 1941. Minnie's gravestone courtesy of Find-A-Grave user Tom. If there are any cousins reading this that have a picture of Minnie, I would be truly overjoyed to receive a copy (contact box is located on the side-bar to the right)! 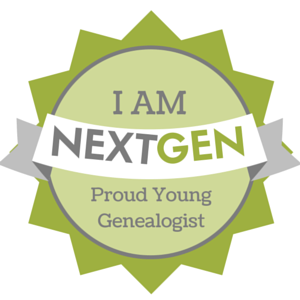 I am also always on the hunt to find out more about Peter Newgard... where he came from in Denmark and what happened to him after he left the family in 1891 (for Chicago?) continues to be a brick wall for me. Follow to receive notification of new posts via email!